I was given the opportunity to partner with Jane.com again, and will partner with them throughout 2018! Each month, I will be gifted some items from Jane in exchange for a feature and review. I was able to do a Holiday feature with them in December, and you can read that post here. I am excited to share this brand with you because I have enjoyed shopping with them before our partnership. Jane gives individuals the uniqueness of a boutique with the trendy styles and decor they offer, while also providing the ease of online shopping. In case you haven’t heard of Jane.com, let me tell you about them! They offer hundreds of boutique deals up to 80% OFF featuring categories such as home decor, clothes, shoes, maternity, accessories, and more, with major discounts for 72 hours. They make it really simple to shop online or on their app. You just need to create an account (and if you’re using your phone, simply download their app!). You will find new things posted every single day, along with sneak peeks of what will be coming available in the next few hours. And one more thing – Jane’s newest feature allows you to click a button for a notification when the particular sale deal you missed comes back! Each boutique I ordered from on Jane sent an email confirming my purchase within an hour, and I was also notified when each thing shipped and given a tracking number. I like that the boutiques share sizing information directly on the Jane website, so it helps make ordering easier. I loved everything Jane.com let me pick out. If you read last week’s blog post, you know I am SUCH a fan of maxi dresses and am always on the hunt for cute patterns, colors, and styles when springtime hits. Since I’m a teacher in sunny, hot Arizona, looking for dresses that double for work or play is always a bonus. 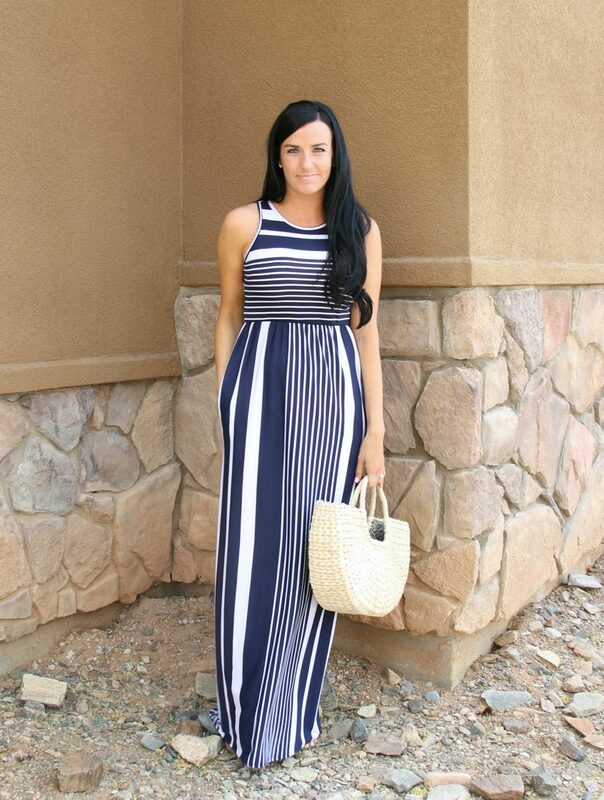 This striped sleeveless dress (with pockets!) came in a few color choices, and it was SO hard to choose! I always think of navy and white as a timeless combination, and so perfect for spring and summer. I like to pair cognac or gold with navy, and have plenty of accessories in those colors since they work for all seasons. I got a size small and it fits as expected – I LOVE the length – and I’m 5’5″ for reference. Jane.com usually has a number of dresses for sale on any given day, and I’ve noticed they continue to feature trendy floral dresses along with t-shirt dresses which are perfect for both teaching and enjoying summer days off! Click here to shop their current dress selection! When I think of spring staples in my closet, I think of my go-to weekend pieces: denim shorts, a t-shirt, and sandals. I found all 3 of those things on Jane when I was shopping. I got my normal size in the shorts, and like the flattering fit. I probably could’ve sized up for a more relaxed fit, too. 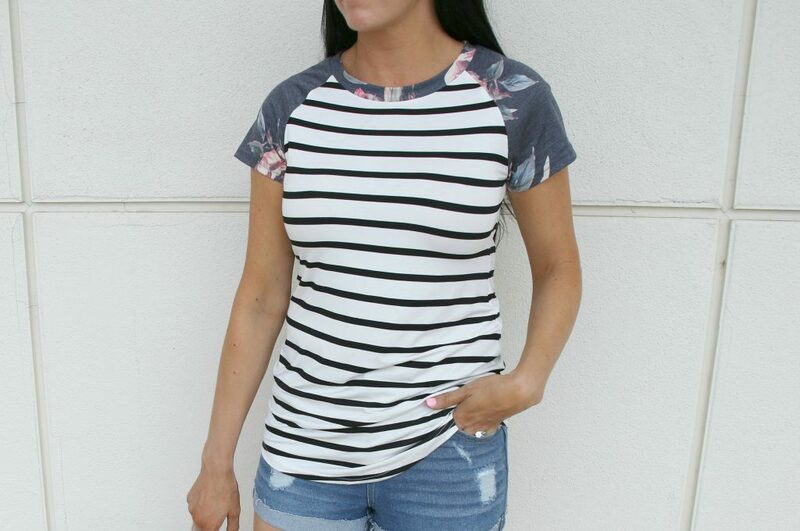 The tee is a size small, is a cute length, and also looks fun front-tucked or knotted. My sandals were true to size, and they added some frill with the cute little ruffles. I think it’s awesome that my whole outfit was put together from Jane.com. Have you tried shopping on Jane.com yet? What is your favorite category to browse? I recently took a look at the “Pets” category and was blown away with how beautiful my order of these digital watercolor prints came out of my pups Amy and Max! *As stated above, this post was created in collaboration with Jane.com and I was gifted their items in exchange for my personal and honest review. All opinions are my own.